Camilo Sanin, who is currently a graduate student at the Maryland Institute College of Art (MICA) and also the winner of prestigious 2009 Bethesda Painting Award, is currently showing in an exhibition titled Underlying Structures at Bethesda's Orchard Gallery. The opening reception, part of the Bethesda Art Walk, is tomorrow, September 3rd from 7-9pm. 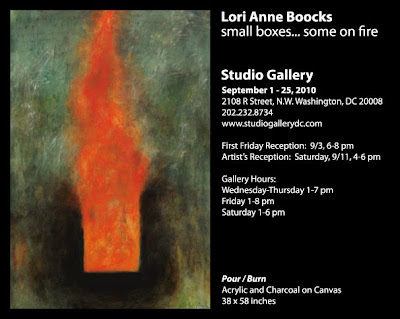 Lori Anne Boocks and Jan Willem van der Vossen open at Studio Gallery with receptions on Friday 9/3 from 6-8pm (for the Dupont Circle galleries First Friday openings) and again on Saturday 9/11 from 4-6pm.